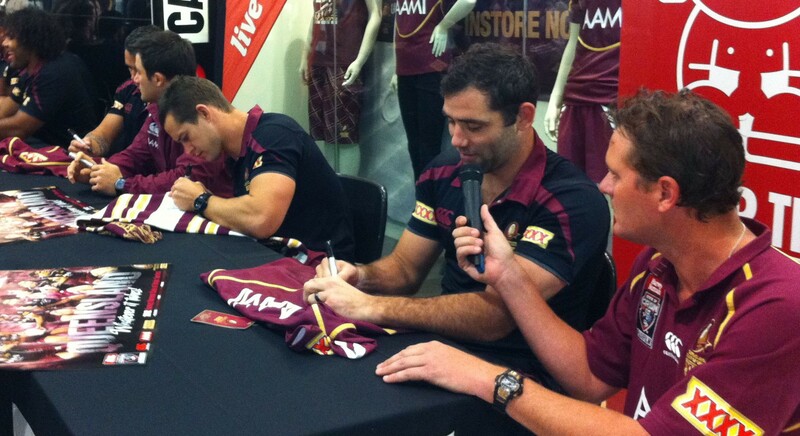 The Queensland Origin team sign autographs and are interviewed by Ash from Nova 106.9 Right to left: Ash, Cameron Smith, Ashley Harrison, Cooper Cronk, Corey Parker and Sam Thaiday. Origin fever reached the heart of the city today as hundreds of loyal maroon supporters lined up in the Myer Centre to meet the Queensland State of Origin team. Queensland Origin coach Mal Meninga has called in Corey Parker as 18th man in the only change made for next Wednesday night’s rugby league blockbuster. Parker replaces Daly Cherry-Evans as 18th man but has been brought in specifically to cover forwards Matt Scott (family reasons) and Ashley Harrison (groin injury). Queensland captain Cameron Smith said he felt very confident in Parker if he was called upon to play. “Obviously Corey’s been here before and he’s played a few State of Origins. So it’s great to have him back, the big fella had a huge smile on his face in camp today,” he said. The team head to Roma tomorrow where a crowd of up to 5000 people is expected. “Hopefully there’s a big crowd up there. They love their footy out in the country,” Smith said. Queensland will be trying to wrap up the series in Sydney which would give them the unprecedented record of seven series victories in row. “We expect NSW to come out and throw everything at us,” he said. The team will base themselves on the Sunshine Coast till next Tuesday when they fly to enemy territory in Sydney. Smith was happy to not be in New South Wales till then. “We try and stay out of NSW for as long as we can really. I don’t really like that place,” said Smith, drawing laughter from the crowd. The Queensland team for game two is: 1. Billy Slater 2. Darius Boyd 3. Justin Hodges 4. Greg Inglis 5. Brent Tate 6. Jonathan Thurston 7. Cooper Cronk 8. Matthew Scott 9. Cameron Smith (captain) 10. Petero Civoniceva 11. Nate Myles 12. Sam Thaiday 13. Ashley Harrison 14. Matt Gillet 15. Dave Taylor 16. Ben Hannant 17. Dave Shillington. 18th Man: Corey Parker. 19th Man: Ben Barba.